http://vanzandtmilmore.com/wp-content/uploads/2017/07/Generic-ePostcard-Perforamce-Announcement-FBookLA-08-12-17wo-1.jpg 600 600 VanZandt Milmore http://vanzandtmilmore.com/wp-content/uploads/2016/05/logo.png VanZandt Milmore2017-09-05 09:45:292017-10-02 11:03:25John D Beck Guest-Stars in "You've Got Hate Mail"
JAWS 2 REUNION LOS ANGELES! 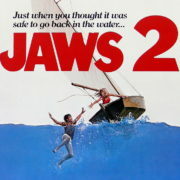 http://vanzandtmilmore.com/wp-content/uploads/2016/06/jaws2may10.jpg 693 909 VanZandt Milmore http://vanzandtmilmore.com/wp-content/uploads/2016/05/logo.png VanZandt Milmore2017-05-17 15:10:232017-05-17 17:32:17JAWS 2 REUNION LOS ANGELES! “YOU’VE GOT HATE MAIL” ENTERS FOURTH YEAR IN POLAND! http://vanzandtmilmore.com/wp-content/uploads/2016/11/6494_1_PUBLISHED_FULL.jpg 2848 4272 VanZandt Milmore http://vanzandtmilmore.com/wp-content/uploads/2016/05/logo.png VanZandt Milmore2016-11-28 11:54:552016-11-28 18:42:18"YOU'VE GOT HATE MAIL" ENTERS FOURTH YEAR IN POLAND! http://vanzandtmilmore.com/wp-content/uploads/2016/09/Caroline-Aaron-2.jpg 1066 1600 VanZandt Milmore http://vanzandtmilmore.com/wp-content/uploads/2016/05/logo.png VanZandt Milmore2016-09-20 15:20:462016-10-10 17:12:31CAROLINE AARON JOINS "YOU'VE GOT HATE MAIL"
“Merrily We Dance & Sing (or “The Naughty Boy”) Published and Available to License! Of all the Van Zandt/Milmore shows, this may be Billy’s favorite. 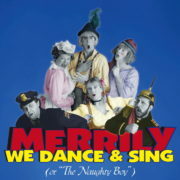 This was our first musical after years of nothing but writing and performing farce. Why a musical? Because no one told us we couldn’t. 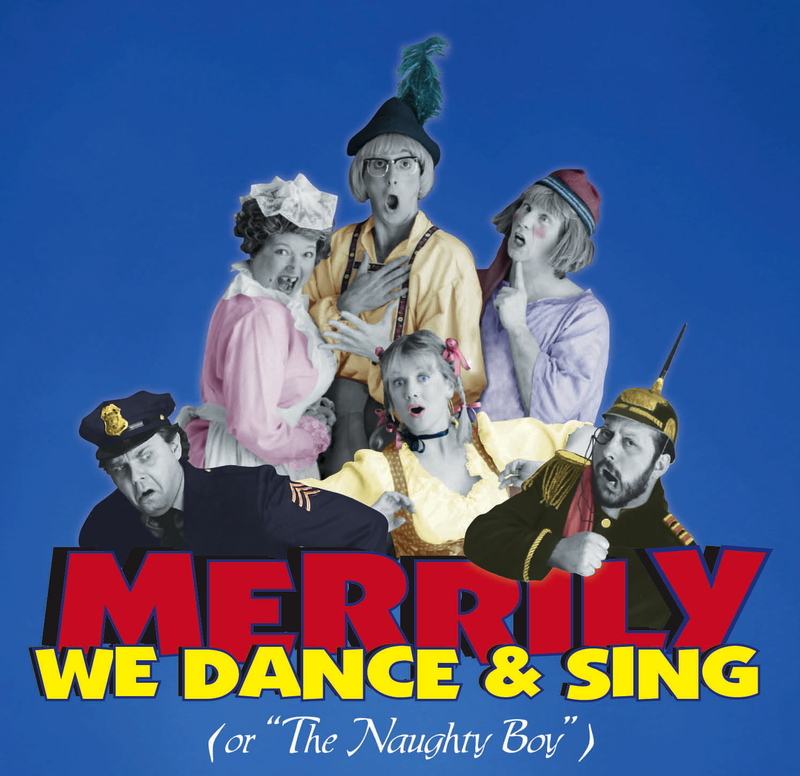 “Merrily” is the story of a community fine arts league putting on their annual operetta and what happens when a serial killer escapes from the nearby Home for the Criminally Insane and gets loose in the theater. Well, it started out that way. We had envisioned the killer stopping the show and keeping the audience captive, with the show taking place off the stage and contained within the theater seats and the lobby. But once we started writing the actual musical within the show, we just couldn’t stop and decided to put the cops and the escapee into the musical itself and force the “actors” to make sense of it all. Ed Alton, who had done the music for all our TV shows, was recruited to arrange the music we’d written. At the time he’d agreed, we were talking about one or two songs. By the time we handed the show to him to orchestrate, one or two songs had turned into fifteen or twenty songs. God love him. He could have said no but instead took it on. He did a masterful job that none of you will ever appreciate because he had to turn our one-note piano-plunkings into arrangements for a 30 piece orchestra, then play every instrument and record the arrangements, all in the right keys so we could sing along with the recording when we started rehearsal two weeks later. It’s fantastic piece of work. Kitty Cleary, our in-house costumer, made our silly show even sillier with the lederhosen and feather hat costumes. Artist Amy Bingler hand-painted a phenomenal backdrop of the alps (where if you looked close you’d see Julie Andrews singing about the hills being alive). And our Van Zandt-Milmore Unofficial Rep Company was in top form. Tom Frascatore, as good as it gets, starred as the husband of the Fine Art League’s president doing an hilarious Harvey Korman/Sid Caesar/Weiner schnitzel Man accent, constantly abusing (and being abused by) his show-hogging wife played by my favorite onstage foil Sherle Tallent. 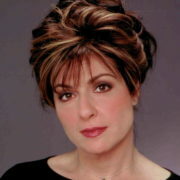 (What a sport – the horrible things we’ve done to her onstage over the years!). Art Neill and his glorious voice played the Major-General. Glenn Jones, who at this point has probably done more of our plays than Jane and I have, perfected his “fool” character here. And Jane was spectacular as the musical’s talentless ingenue. Jane likes to tell the story about the two-story house we built for Sherle’s (Carnation’s Nan’s) home. I never think about safety if it’ll get a laugh and as a result we wrote a bit where in the middle of the song “Once Upon a Time” Jane would fall backwards off the second floor of the house and then pop out the door below, semi-conscious, to finish the number. Well, she was scared to do it. I told her there was nothing to it and made her feel like a big coward who was going to ruin our show if she didn’t fall backwards, in the dark, off a two-story platform. She said, “Then you do it.” So I climbed the ladder to the second floor to show her how it was done, and looked down on the landing pad which looked like a sponge from up there. Instead of demonstrating the bit, I just looked down and reassuringly said, “Oh, yeah. It’s easy. You’ll be fine.” and then crawled down the ladder. She did it anyway. Huge laugh. You can see it on YouTube. The show became so crazy in Act Two that even as authors we were too confused to follow the plot. The audiences didn’t care but it bugged us. So instead of publishing it, we rewrote the book and did a second production a few years later. It was huge success but it wasn’t as funny to Jane and me, although the story made more sense. 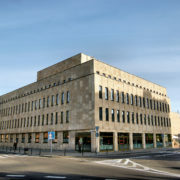 The highlight of the second production was the addition of “Lord of the Hamlet”. A Michael Flatley-like Riverdance number that came out of nowhere in the middle of a chase scene. Choreographer Jackie Neill did an amazing job teaching the non-dancing cast to Irish step dance on a stage full of fog. So Jane and I were left with great moments from the second show and an overall funnier production from the first show. And then life got in the way of us rewriting it. However, this past year we put other things aside and decided to finally merge the two productions into the show we’ve finally published. And in reading it over, I’m getting itchy to do it again. I love it. http://vanzandtmilmore.com/wp-content/uploads/2016/07/IMG_3501-1.jpg 1448 1493 VanZandt Milmore http://vanzandtmilmore.com/wp-content/uploads/2016/05/logo.png VanZandt Milmore2016-07-14 17:39:062016-09-28 11:12:03"Merrily We Dance & Sing (or "The Naughty Boy") Published and Available to License! 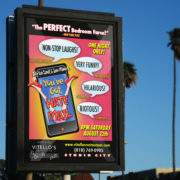 “You’ve Got Hate Mail” in Los Angeles! Sold Out! ADDITIONAL SHOW ADDED FRIDAY, OCTOBER 7, 8PM! 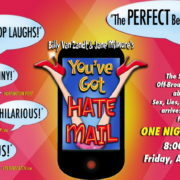 The international Off-Broadway hit takes an hysterical look at the world of on-line hook-ups and break-ups when an extra-marital affair goes horribly wrong, thanks to an x-rated e-mail sent to the wrong mailbox. The story is told entirely in e-mails from laptop computers, although the play still manages to have an unforgettable chase scene fueled by smartphones. http://vanzandtmilmore.com/wp-content/uploads/2016/07/YGHM-LA-wo-fb-v1.3-3.jpg 472 743 VanZandt Milmore http://vanzandtmilmore.com/wp-content/uploads/2016/05/logo.png VanZandt Milmore2016-07-14 17:34:422016-07-28 17:34:50“You’ve Got Hate Mail” in Los Angeles! Sold Out! 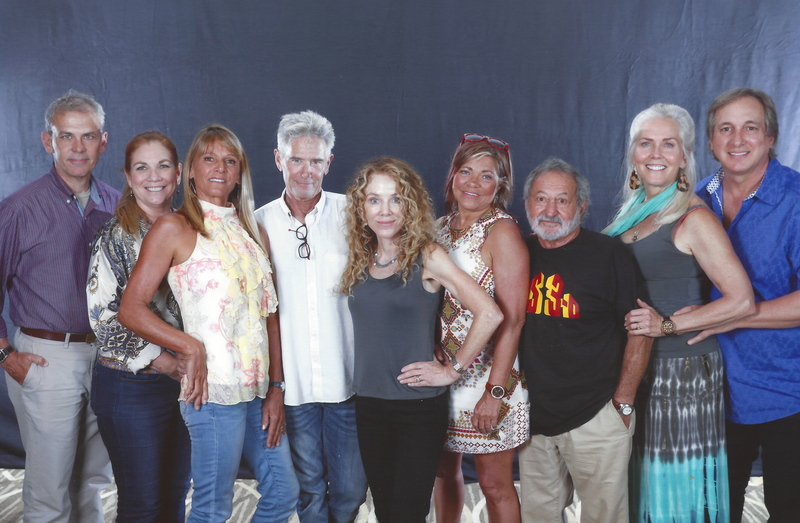 Cast members from “Jaws 2” were reunited at the recent Hollywood Show in Los Angeles. (L to R: G. Thomas Dunlop (Timmy), Martha Swatek (Marge), Cindy Grover (Lucy), Ben Marley (Patrick), Gigi Vorgan (Brooke), Donna Wilkes (Jackie), Joe Alves (Associate Producer, Production Designer, Second Unit Director), Ann Dusenberry (Tina), and Billy Van Zandt (Bob). 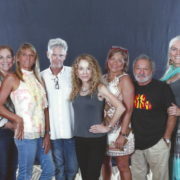 http://vanzandtmilmore.com/wp-content/uploads/2016/07/Jaws-2-reunion-Hollywood-Show-Misc-show-1.jpeg 3635 5558 VanZandt Milmore http://vanzandtmilmore.com/wp-content/uploads/2016/05/logo.png VanZandt Milmore2016-07-13 17:55:572016-09-22 16:51:52Jaws 2 Cast Reunited!